Deathcamas is distributed in North America from B.C. to Saskatchewan and south to Colorado, Utah, California, and Baja California (FEIS). Death camas grows at low to mid elevations. On the coast, it coincides closely with the occurrence of Camasia quamash. Open forests and forest edged, damp meadows, and rocky or grassy slopes. Death camas is an increaser with grazing. Seeds ripen in July and August and are dispersed by mid-August. Seeds germinate in the spring and a bulb is formed in the first year. 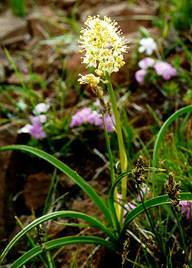 Death camas reproduces vegetatively from bulb fragments and sexually with sexual maturity taking up to 3 years. This plant is toxic in all forms and caution must be taken when handling plant material. Paper bag at room temperature. Death camas grows rapidly in early spring from root reserves when temperatures are cool and soils are moist.